What is INFINI Skin Rejuvenation? INFINI is an FDA approved non-surgical cosmetic treatment designed to improve fine lines and wrinkles, tighten the skin, boost collagen, and improve scars. It achieves these results by combining micro needling technology with radio frequency energy. INFINI is commonly used to treat the skin of the face, neck, and chest, and the skin around the eyes and eyelids. INFINI Skin Rejuvenation can be used on all skin types and all skin colors. How does INFINI Skin Rejuvenation work? The INFINI laser uses tiny micro-needles to deliver radio frequency energy into the skin below the skin surface. This increases new collagen formation resulting in tighter skin and a reduction in fine lines and wrinkles. The INFINI procedure delivers the radio frequency energy in a very accurate and controlled manner, resulting in a treatment that is done with precision. Because the energy is placed deeper under the skin surface, the skin heals very quickly. There is either no or minimal downtime. Most patients can resume their normal activities immediately after leaving the office. Patients usually have one or at the most two days of redness. Makeup can be applied the day after the procedure. What Results Can I Expect From INFINI Skin Rejuvenation Treatments? Results start becoming visible over a period of 3-4 weeks as new collagen is formed. The optimum result is achieved four months following the last treatment. Most patients will require two or three treatments, although acne-scarring patients may need a few extra treatments. 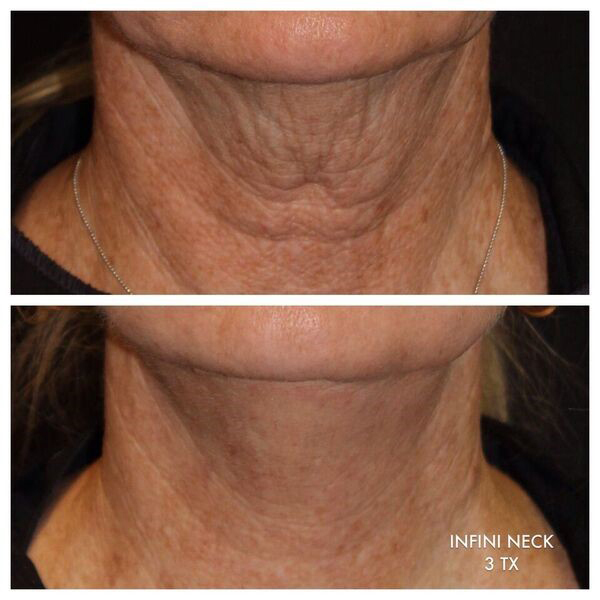 The photos below show the kind of results that can be achieved with INFINI laser treatments. Introducing INFINI skin rejuvenation laser treatments for skin tightening, scars, and stretch marks to Santa Moica and surrounding Los Angeles areas.